While boudoir shoots usually revolve around a beautiful bed, with plush bedding and gorgeous textured pillows, it’s not exactly necessary to make a shoot spectacular. In this styled boudoir shoot, much of the emphasis was taken away from the bed by creating a modern meets natural floral install. 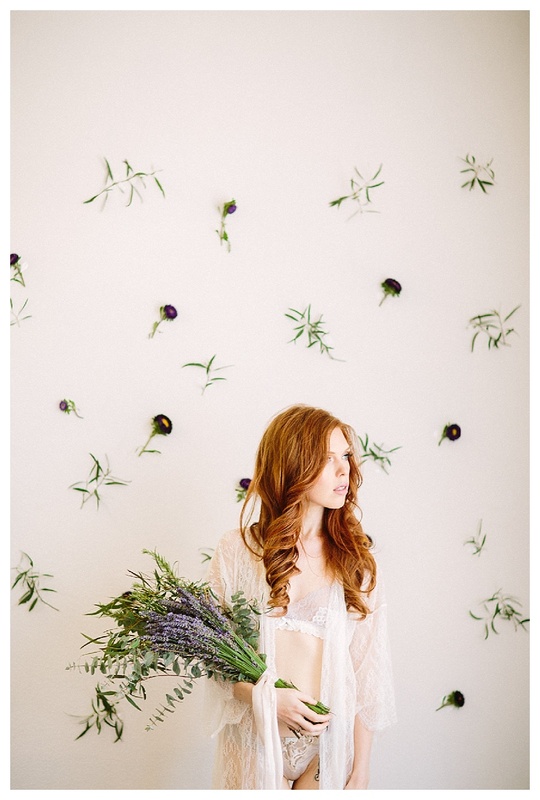 This fun botanical backdrop immediately became the shoot’s focal point. A pop of bright cobalt blue really adds a wow factor to this shoot. The color of the lingerie not only compliments Chelsea’s gorgeous red locks and bright blue eyes, it also contrasts nicely against the neutral, airy and light studio space. When considering what lingerie to incorporate into your next shoot, remember that while neutrals are always lovely, a pop of color can do a lot to add another layer of interest. Not sure what color to go with? Think about what hue would compliment your client or model’s skin tone, hair color, or eye color and go from there. Add breadth to your shoot by mixing it up a bit. Instead of sticking to one wardrobe look, try experimenting with a handful of pieces. Chelsea had a total of three wardrobe changes, and just be altering the lingerie, her entire look was transformed. Mixing up the wardrobe pieces is an easy way to accomplish variety within the same styled shoot. Like we said, you don’t necessarily need a bed to make a boudoir shoot amazing, but it doesn’t hurt when the bed is this gorgeous.